Do you buy a lottery ticket most weeks? 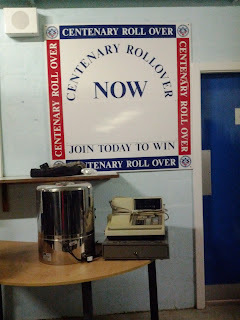 Are you frustrated that you have only won an occasional £10? Would you like the chance to win £100 every day Monday to Saturday? Would you like to be the person who wins £1000 in a weekly star prize draw? Could you imagine driving off in one of two brand new cars to be won this year? 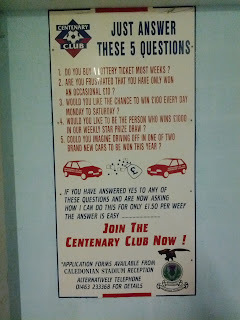 The Centenary Club poster is just one of many fantastically quirky signs up inside the Jock McDonald Stand at the Caledonian Stadium. 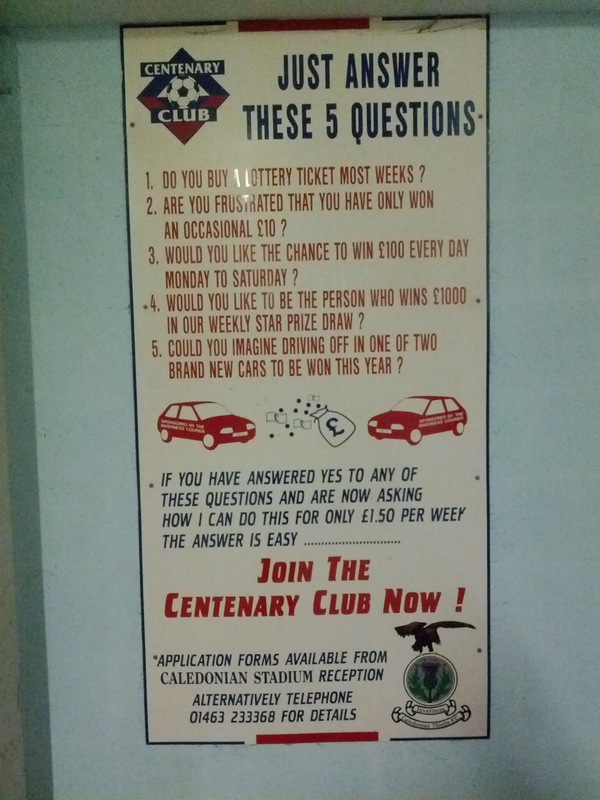 For instance, It's not just two cars or a grand in cash that you can win, as part of the Centenary Club. 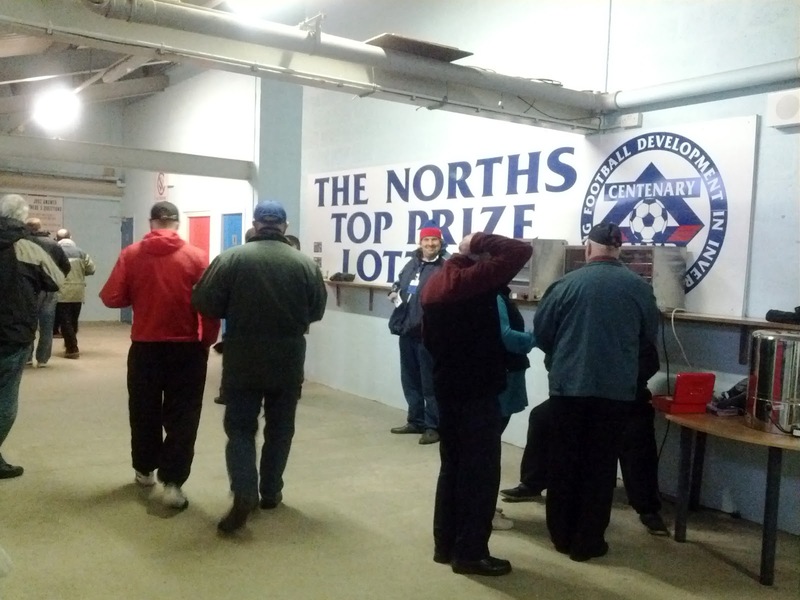 You can also win..............a second hand hot water machine and a used cash register! 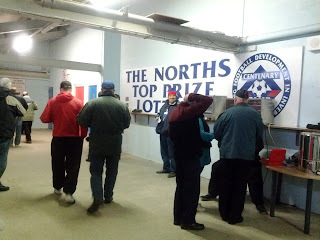 That said, you really should get involved in “THE NORTHS TOP PRIZE LOTTERY” - you really would be a mug not to! 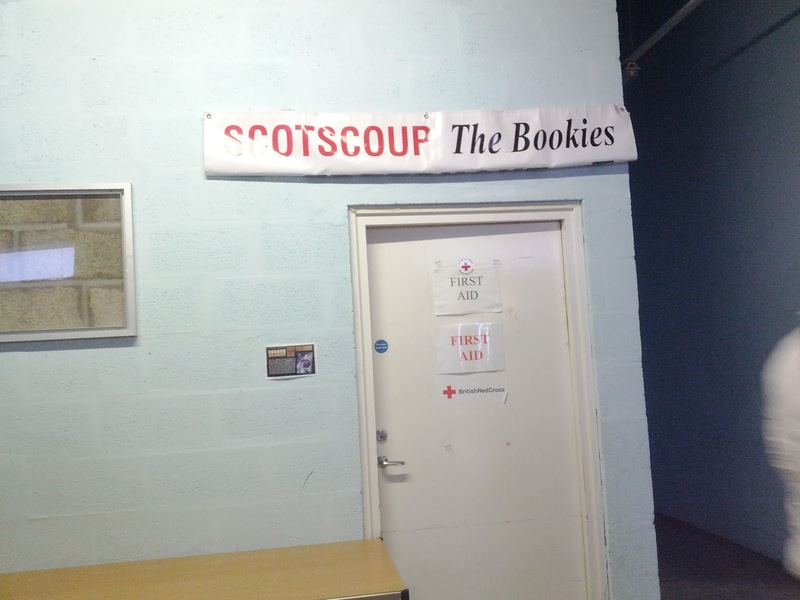 But....do they have a bookmaker that is also a First Aid Room?! 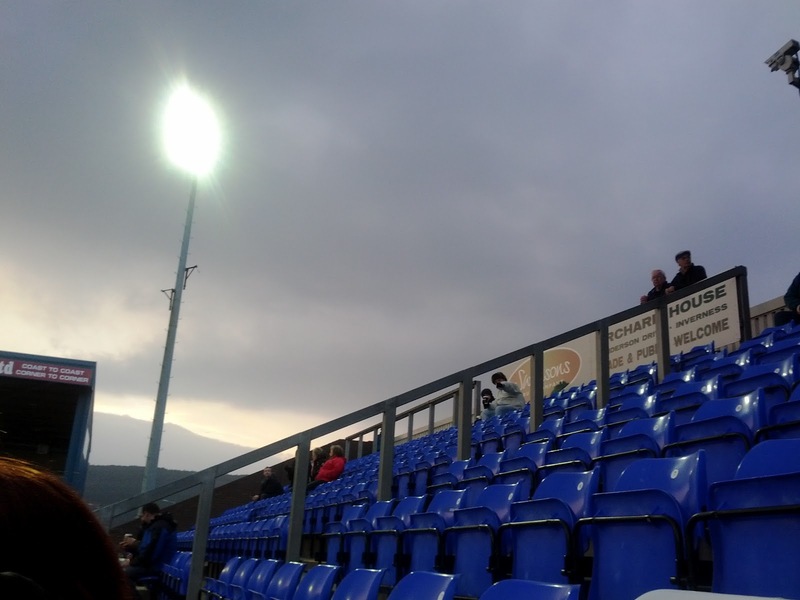 In terms of the pitch-side activity, the ground is dominated by the Main Stand which runs along one side of the pitch, is all seated and covered – bizarrely with the exception of a couple of “wings” at each end that sit out in the open and completely uncovered! Opposite is a small open terrace which is unused and at each end are the North (aka the Bridge) End and the South Stand, which houses the travelling support. One thing that should be said for the Main Stand is that there is plenty leg room and seats are well-spaced so you aren't more or less straddling your neighbour, like at Easter Road. The ground also had a bit more character about it than say, the Falkirk Stadium, even though it only has three ends. When I entered the Main Stand, for example, it didn't feel like a reasonably new built stadium. 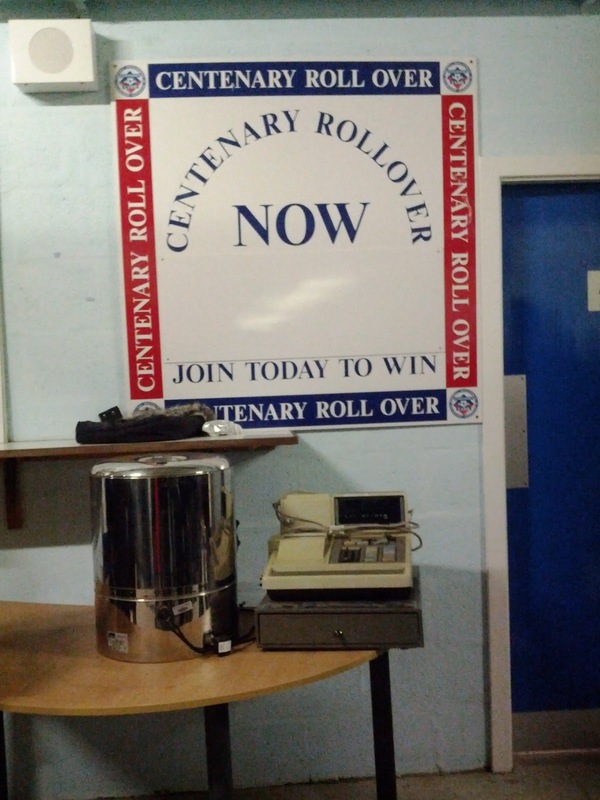 There was something distinctly lower-league about it – in a good way! It feels quite intimate and enjoyable to be in and, when you factor in the incredible poster offerings, Caley score quite well in this aspect. 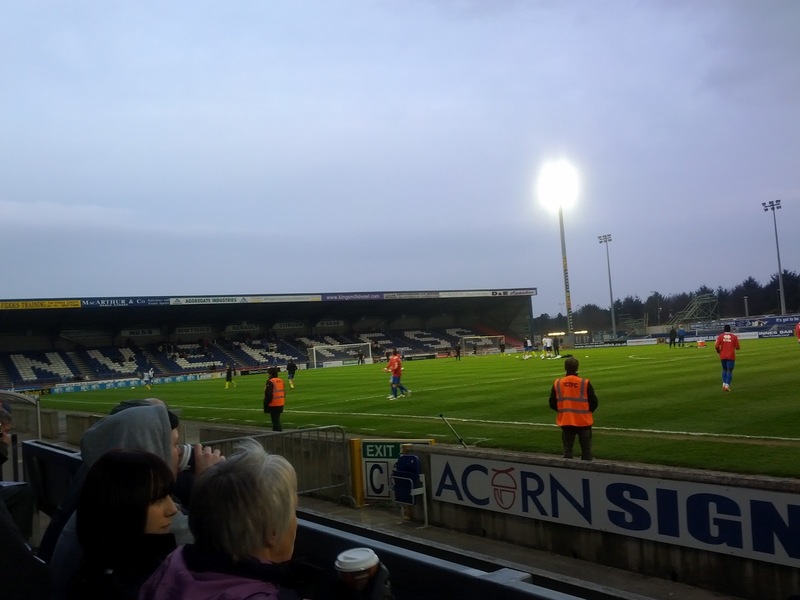 In terms of the catering, I was a little confused when I discovered that the pies are actually cheaper than the hot drinks at the Caledonian Stadium. I then became worried, because I know how inexpensive the constituent parts of a cup of tea are....and wondered what sort of horror show of a pie I was going to be offered! I need not have worried. The pie at Caley was exceptionally nice. Very flavoursome. It did cost me £1.90 though, which was steep. With the tea coming in at £2.00 it certainly isn't cheap to eat inside the ground. 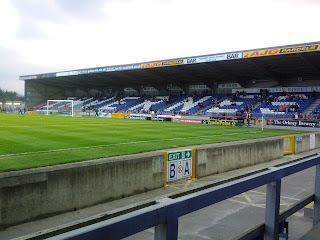 Caley fans were, for me, textbook Invernesians – extremely polite, very warm and welcoming and most of all....unbelievably laid back. There wasn't the intensity from the fans that you get elsewhere in Scotland. I guess this has its pros and cons as I doubt you'd find the Caley fans getting particularly raucous and driving their team on as “12th man”. 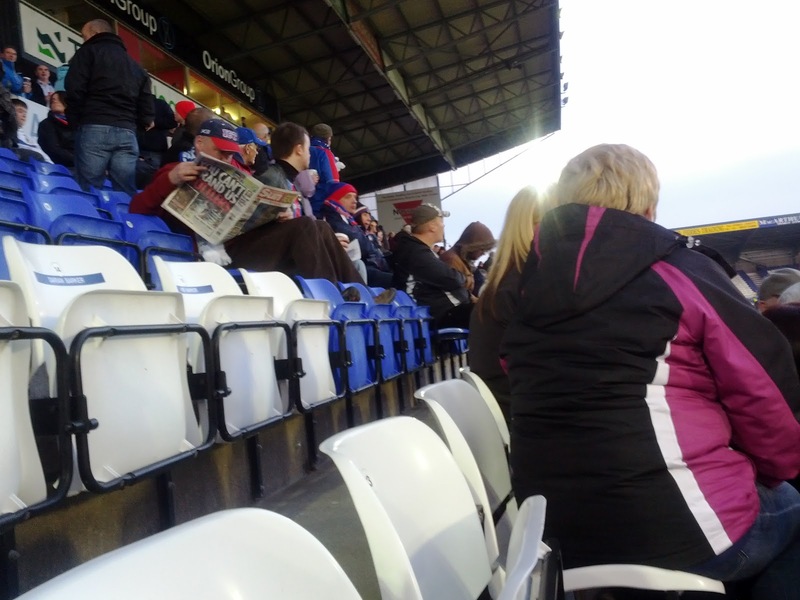 Nonetheless, I also doubt you'd find many Caley fans behaving like animals! All round, I rate the Caley fans quite highly. They aren't the most observant, with a majority not spotting the foul for the penalty, but they are quick to praise the opposition as and when it's deserved and do seem to have a wonderful relationship with Terry Butcher and Maurice Malpas with whom they interact for most of the game. On the pitch, ICT were described by Terry Butcher as being like “11 strangers” and at times, it was all very disjointed. The home side did create a few really decent opportunities, but these came about more as a result of errors from St Johnstone defenders than by craft. The midfield struggled to get any sort of passing going with a lot of ball given away and, defensively, ICT really weren't tight enough – with the exception of Ross Tokely. I suspect it might be quite Jekyll and Hyde from Caley at times as there are clearly decent ball players in there, powerful boys too. Looking at ICT's position in the league table though, 10th is arguably quite fair. I'm not sure they are better than St Mirren, Aberdeen or Kilmarnock above them and they are certainly not as poor as Hibs or Dunfermline. Graeme Shinnie: Tough night for the boy up against Croft, Mackay and Sandaza (who loves the right channel) but I think he's a good wee player. Pacey, with an excellent left peg, he offers Caley a solid option going forward. He reads the game fairly well too, covering for his centre backs as all good full backs should. Ross Tokely: How old is this guy now? What a big beast of a man he is, though! More or less won everything in the air, is absolutely no nonsense when under pressure and offers a serious threat from set pieces. He physically dominated Cilian Sheridan for most of the 90 mins and even did the “big man up top” bit at the end which caused havoc! Gregory Tade: I have to mention him! He had a really strong opening, dropping deep and taking the ball into feet before powerfully running at the Saints back-line and causing them some serious problems. Then....the shambles began. If a miss from 8 yards with the goal gaping wasn’t bad enough, somehow the big fella thought it was a good idea to shoulder charge Liam Craig to the ground in the box right in front of the ref. You know what happened next. It only cost me £13 to get into this game thanks to a special promotion from Caley and for that money, I was pretty pleased with what I got. That said, it would ordinarily be £26 for entry to the Main Stand and that would not be such good value! More than a standard league game at Hearts, Dundee United or Motherwell? Even more than St Mirren? 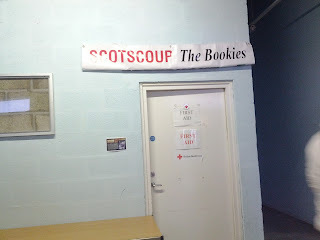 I can't in all honesty say that Caley did enough on the park for me to recommend someone making a special trip north to see them if you needed to pay that sort of dosh to enter. That said, the stadium is fun, the food is good (although pricey) and the fans are nice to be around so if you were up in the Highlands and fancied a trip to football, you could probably do worse than going to see ICT.